It's been well over a century since J.M. Barrie's proud, jubilant, young boy who would not grow up delighted and cajoled Edwardian England, from the royals themselves to the upper class families of Bloomsbury and Mayfair, their household servants, their favorite bankers and just about anyone else who fancied stories about the lost childhoods of yesterday. It was a winning combination, indeed. In "Peter and the Starcatcher," the smart, ageless fantasy that creates a timely, innovative and humorous backstory for one of literature's most beloved and treasured characters, Playhouse on Park director Sean Harris ("In the Heights," "Cabaret," "Angels and America") crafts a stylish theatrical experience that pays homage to Monty Python, British holiday pantos, Oscar Wilde, and those copious English musical hall skits that were naughty, wicked and decidedly gay, but gobs and gobs of fun. Using just about every conceivable ounce of stardust, fairy dust, twinkle and afterglow to transport his audience back in time to the magical world of Rick Elice's dizzying reimagined glimpse of "Pan's" beginnings, this production entices and excites with its frequent flights of whimsy, merriment, grandeur, boldness and slaphappy tomfoolery. 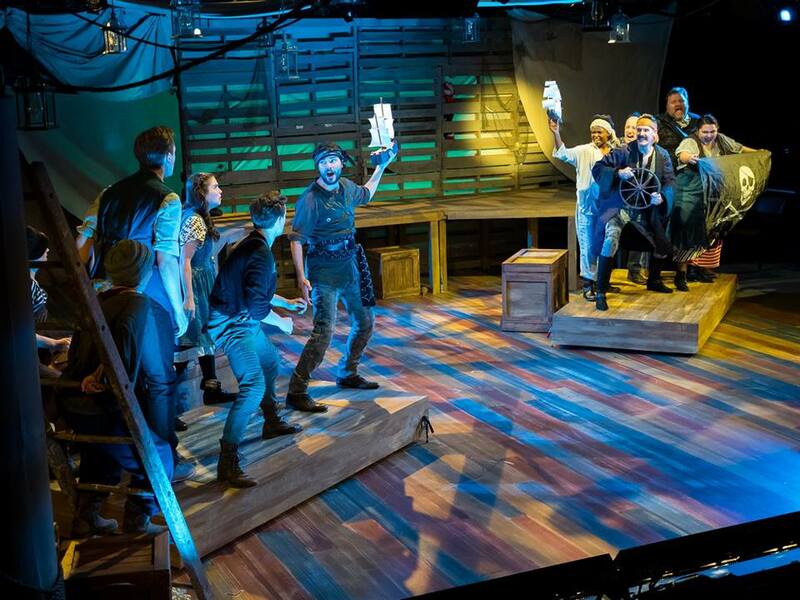 This "Peter and the Starcatcher" rarely misses a beat. 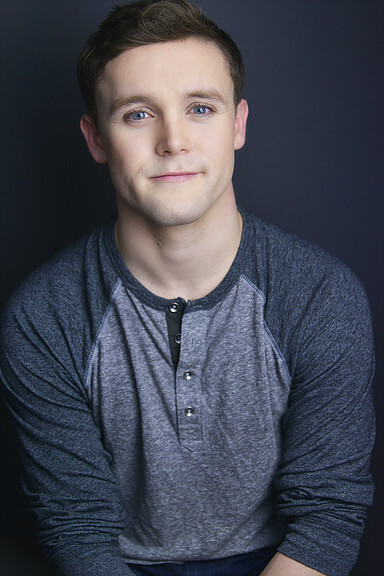 It is, however, decidedly different from the original 2011 off-Broadway production that starred Christian Borle, Adam Chanler-Berat and Celia Keenan-Bolger. While the traditional storybook enchantment remains, as does, the play's goofy, sophomoric humor, some of the action, most noticeably, the distinct, proudly non-verbal stage business that puts the entire cast through some pretty vigorous moves, using ropes, banners, wheels, bridges and assorted props, has been either cut, trimmed or edited, depending on the actual sequence. It's not that the cast can't handle it (they can), it's just not needed in the small, intimate confines of Playhouse on Park's work space. 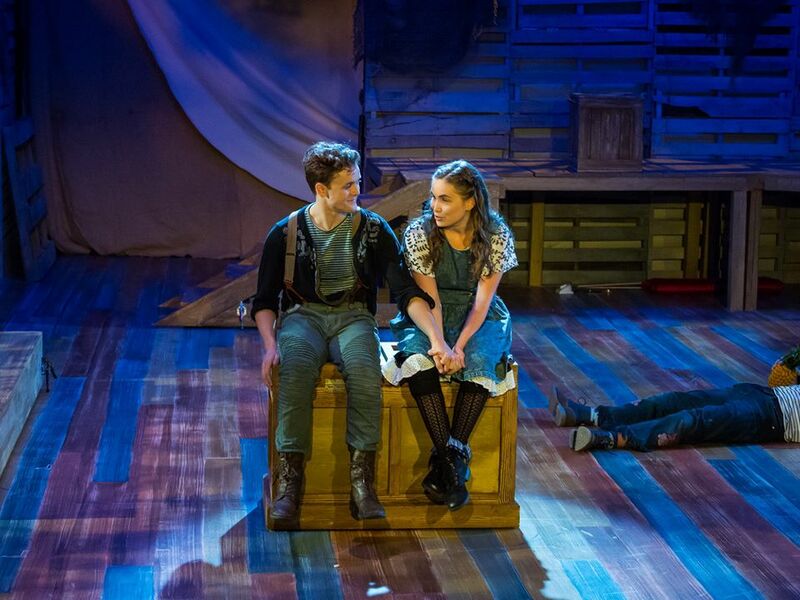 So what exactly is "Peter and the Starcatcher?" you ask. Well, for starters, there's more to the story than bumbling buccaneers, pirate ships, secret treasures and amorous flirtations. Set in 1885, "Starcatcher" takes it cue from Dave Berry and Ridley Pearson's novel and tells theatergoers how Peter became "Pan," how he acquired that special gift of eternal youth, how a dastardly and dark Black Stache lost his hand and became the villainous Captain Hook, how a swirling yellowish thing became a twinkling greenish light named Tinkerbell, how a crocodile ended up tick-tocking and how a mysterious, magical island got its name....Never, Never Land. There's also lots, lots more, including some surprising facts about a very special young girl whose last name is Darling and the very idea of "Pan" flying into a nursery window to take three children, including one named Wendy, on the adventure of a lifetime. And, oh yes, there's that special ending, which, is this production, is different from the 2011 off-Broadway edition, but, nonetheless, works it's decided magic. It will make you smile, perhaps even shed a tear or two. But it's the absolute perfect conclusion to the "Peter Pan" story. 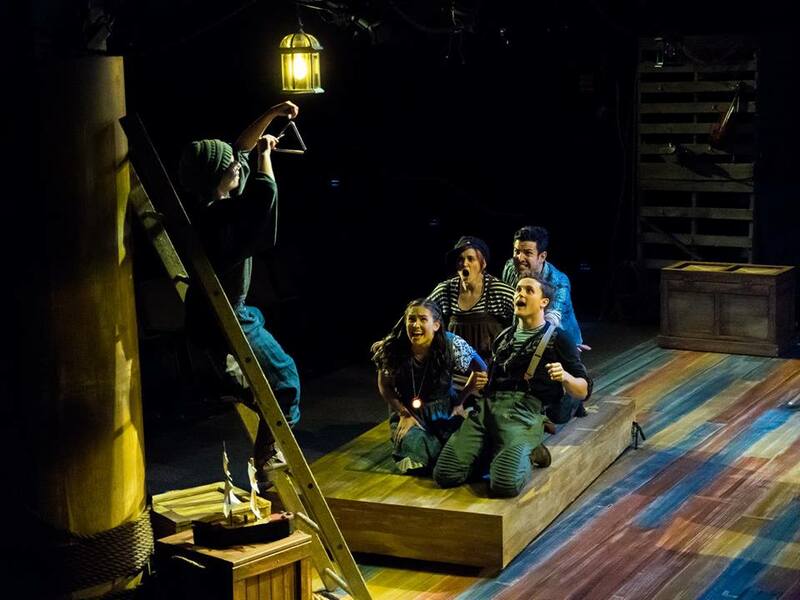 Musically, "Peter and the Starcatcher" is a play with music. There are a few, scattered songs here and there, but this is not a traditional musical like "Finding Neverland" or "Mary Poppins." Here, the musical numbers are limited to a pirate, a mermaid, a sailor and a chorus. Nothing terribly exciting or hummable. Just musical moments that advance the storyline or tickle your funny bone. 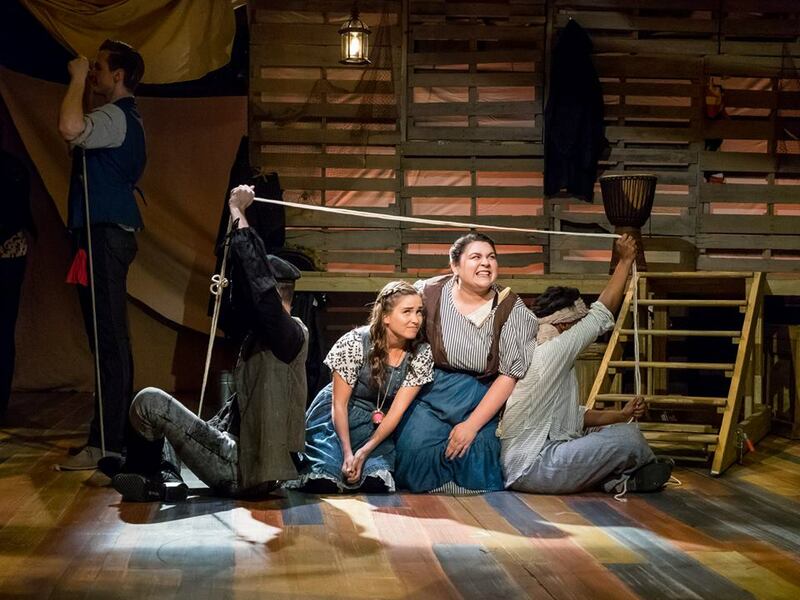 Regardless, musical director Melanie Guerin ("In the Heights") has great fun with these tireless ditties and the show's moody and evocative background music, which is used most effectively throughout the two-act production. Synchronized with some expertly timed beats, ticks and quirky sound effects, Guerin keeps things playful and magical, which is exactly the feeling dictated by the show's creators. 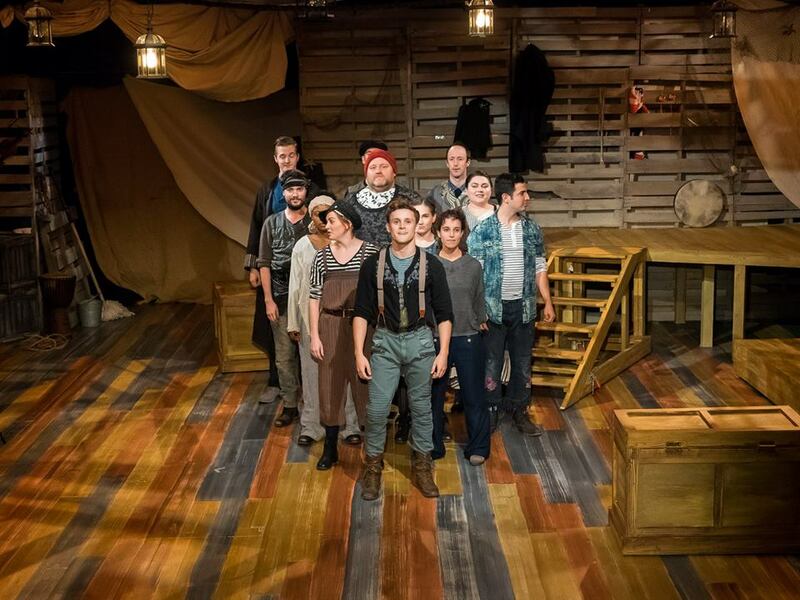 To bring the story of "Peter and the Starcatcher" to life, Harris has assembled a talented, resourceful, energetic ensemble team of twelve. The are Jared Starkey, Matthew Quinn, Natalie Sannes, James Patrick Nelson, Thomas Daniels, Elena V. Levenson, Nick Palazzo, Brianna Bagley, Sandra Mhlongo, Colleen Welsh, James Fairchild and Nicholas Dana Rylands. Everyone stands out, individually or working opposite one another in pairs, trios or one big ensemble. This is not an easy show to pull off. Nonetheless, the gusto, the intuition, the spirit, the rawness, the drive, the spark and the enveloping energy of this group is bloody amazing at every twist, turn, wink, pose, grimace, surprise or costume change. To pull this feat off effortlessly is one thing. But to remember all of the stage blocking, movement, pantomime, expressions, body language, line delivery and conceits Harris supplies in full British panto fashion, is an accomplishment in itself. The fact that it all comes together so seamlessly (no sensory overload, here) immediately impresses. As does the cast's intuitive level of trust, dedication, talent, stamina and synchronicity. 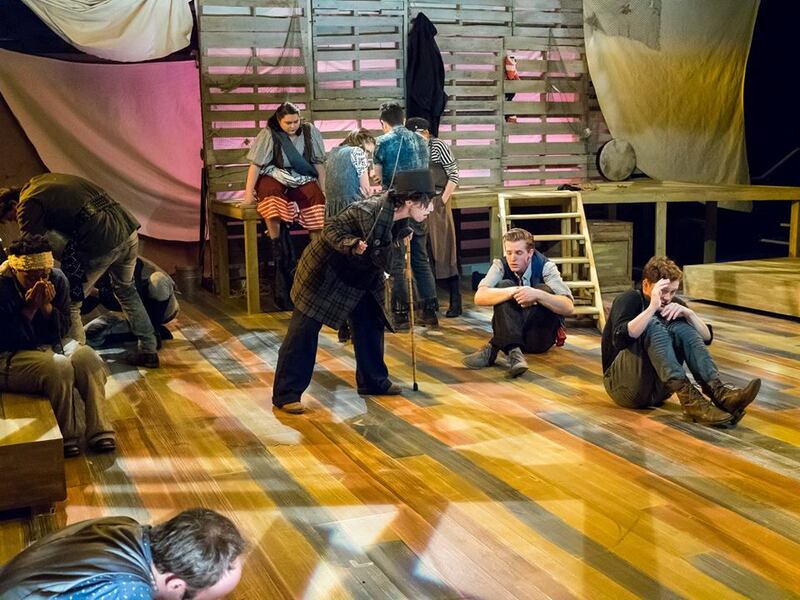 Jared Starkey, an actor of considerable charm and magnetism, takes hold of Peter's journey, projecting just the right amount of warmth, heroism, restlessness, angst and soul-searching indicative of J. M. Barrie's famous creation. His athletic, animated prowess is unbeatable, as is his steadfast mime and balletic skills. Watching him shift gears with split-second timing or simply just jump, spin, twirl, kick, shake or bounce about the Playhouse on Park set like a turn-of-the-century circus acrobat adds nuance, color and sweep to his boyish characterization. Elsewhere, he inhabits and projects the wonder, the mystery and the glimmer of the orphaned, lost boy who eventually can and will fly. 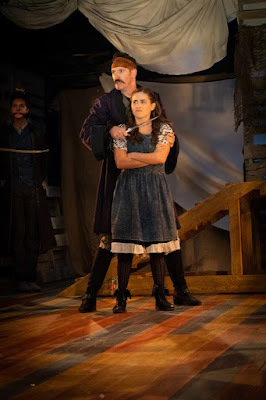 In the role of Molly, a part that seems tailor-made for the captivating Natalie Sannes, the actress offers a plucky, determined, good-natured portrait of a young girl and apprentice starcatcher whose identity in the "Peter Pan" story is revealed during the final minutes of the play. As the dandy, overly effeminate Black Stache, Matthew Quinn hams it up in true British panto fashion, His gleeful, gayish comic turn would probably make Oscar Wilde green with envy. Regardless, it's a performance that is delightfully merry, campy, giddy and outrageous, much to the delight of everyone on stage and in the audience. The actor's penchant for effete mischief, cross-dressing, snarky line delivery, uproarious puns, double takes and double entendres, is unstoppable . A dazzling, spunky, wildly distinctive entertainment, "Peter and the Starcatcher" is an imaginative, uplifting backstory to J.M. Barrie's epic tale of the boy named "Peter Pan." It is an exciting and flavorful adventure, handsomely staged and shaped by director Sean Harris. It is also one that happily launches Playhouse on Park's diverse, new 2018-2019 line up of shows that includes "One Flew Over the Cuckoo's Nest," "Murder for Two" and "The Scottsboro Boys." So grab yourself a ticket. Indulge and enjoy! "Peter and the Starcatcher" is being staged at Playhouse on Park (244 Park Rd., West Hartford, CT), now through October 14. For tickets or more information, call (860) 523-5900.